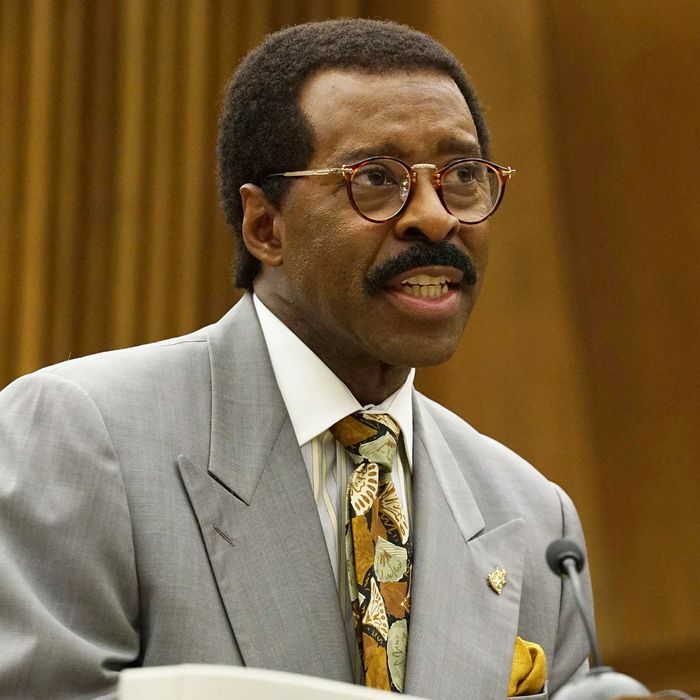 Courtney B. Vance as Johnnie Cochran. So says Johnnie Cochran’s wife, consoling him about a court decision in “Manna From Heaven,” the tough-minded penultimate episode of The People v. O.J. Simpson. Cochran has just been dealt a mixed ruling from Judge Ito on the Mark Fuhrman tapes — a collection of recordings between Fuhrman and a would-be Hollywood screenwriter that’s peppered with racial epithets, in addition to stories of police brutality, planting of evidence, and other instances of corruption. The defense believes the recordings are admissible, because they support the suspicion that the LAPD approached the Simpson case with racial bias, if not the intent to frame their client. The prosecution wants them suppressed entirely, because they’re immaterial to the facts of the case and would encourage the jury to act out of emotion. And for Ito himself, the tapes are a minefield of damned-if-you-do scenarios. Ito’s ruling satisfies no one. He’ll allow only a couple of inflammatory lines to prove that Fuhrman perjured himself. Cochran is outraged, but his wife’s words crystallize an impression the show has been working toward from the start: Cochran wants the tapes to be admissible because he wants to put the LAPD on trial for its institutional racism. “This isn’t a smoking gun in the Simpson case,” he says. “This is a smoking gun for the United States.” That the contents of the tapes will help Simpson go free is of secondary concern. It just so happens that his interest in exposing the LAPD’s sins to a massive public audience dovetails with his ostensible mission to exonerate his client. To Cochran, this case is bigger than O.J. Simpson. And it’s certainly bigger than Ron and Nicole, whose deaths are a distant memory. For most of the series, Robert Shapiro has been cast as the shame of the Dream Team, someone so concerned about his image and maintaining a cozy relationship with the city’s white establishment that he’d rather take a plea than head down an unsavory racial avenue. (Never mind that he’s distancing himself from his own strategy.) “Manna From Heaven” finds Cochran equally guilty of using the Simpson case to service his own agenda. The only difference is that Cochran’s goals happen to bring his client the most favorable verdict possible. If the Simpson case had been a loser — which it looked to be at the beginning, given the wealth of evidence against him — then Shapiro, not Cochran, would have been of better service to his client. In either instance, O.J.’s lawyers are not working for him. He’s just the vessel. The People v. O.J. Simpson has steadily worked toward a comprehensive study in how public scrutiny of the case perverted a pursuit of justice. “Manna From Heaven” frequently makes us aware of the cameras in the courtroom, whether it’s when Cochran ostentatiously dresses down Darden for racist statements or when the lens bears down on Ito as he seeks the least-bad decision on the Fuhrman tapes. For all the concern about jury tampering and the prisonlike conditions of sequestration we witnessed in last week’s episode, the show rejects the argument that jurors were directly affected by the public circus surrounding the case. Of course, just in this episode alone, the drama surrounding Ito’s ruling — his wife’s relationship to Fuhrman, the “toxic” language used to describe her, the pressure exerted from the outside — turns the courtroom into a spectacle that makes impartiality a joke. The jurors may not be watching Larry King Live every night, but they’re getting a version of it through a grotesque mock-broadcast in open court. “Manna From Heaven” is a nasty little episode title, referring to Cochran’s jubilation over having the Fuhrman tapes drop into his lap. Thirteen hours of racist invective is not heaven-sent, however useful it turns out to be in making a case against the LAPD and defending his client. As the end of The People v. O.J. Simpson has drawn near, the show has made its own position on the case less ambiguous. Although Scott Alexander and Larry Karaszewski have been careful to humanize the key players, the “not guilty” verdict is being cast as an act of Dream Team flimflammery, an empty strategy that doesn’t even persuade half the men pushing it. The Fuhrman tapes are cause for more clinking of glasses, just as the bloody gloves were, but victories in the courtroom are hollow in the larger scheme of things. While O.J. cheers over Cochran’s devastating exploitation of Fuhrman’s Fifth Amendment plea, Schwimmer’s Robert Kardashian is sickened. To O.J. the football player, a win is a win is a win. To Kardashian, the Fuhrman tapes are another Pyrrhic victory. For Clark and Darden, the Fuhrman tapes offer the tantalizing fantasy of a mistrial — or as tantalizing as reliving a nightmare can be. All the mistakes they’ve made would be nullified; all the tactical moves the defense pulled could be anticipated and neutralized. It’s telling that Gil Garcetti shudders at the prospect, worried about the $6 million in taxpayer dollars that would circle the drain alongside his poll numbers. Against a defense team that will do anything to win, he’d rather just absorb the loss. His hapless prosecutors are left to twist in the wind. Cochran and F. Lee Bailey’s sojourn to North Carolina to retrieve the tapes reveals the limits of Cochran’s alliterative style. (“I don’t know if you play as well in Dixie,” says Bailey, noting that they’re standing under a statue of a Confederate officer.) Nathan Lane’s sinister wit has been a treat all season, but the ingratiating nonsense he whips up on appeal is especially good. The ill feelings lingering between Clark and Darden over her Fuhrman screwup and his glove screwup finally get a full airing and a touching reconciliation. “You put me on this trial because you wanted a black face,” Darden says. “But the truth is, you never wanted a black voice.” That truth cuts deeper than just Fuhrman, and speaks to Darden’s larger insecurities about his status on the team. Yet he and Clark are able to forgive each other their misjudgments. They’ll be arm in arm when the ship goes down. “Shall I take off my watch and jewelry?” In the middle of a Darden meltdown, Clark flirts deftly with a contempt-of-court charge. After experiencing nothing but setbacks, Clark gets a small measure of relief by securing primary custody of her kids; it is a welcome grace note. It also proves she can win a case.